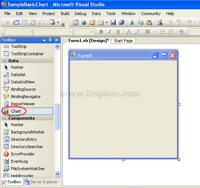 This series shows how to create chart or graph with VB.NET using Microsoft Chart Controls for .NET Framework. 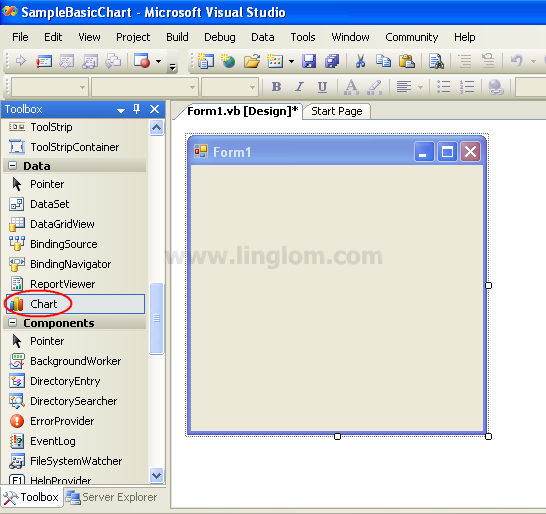 On this post, you will learn how to create a basic chart on Windows Form Application with VB.NET. I use Microsoft Visual Studio 2005 as IDE. Microsoft Visual Studio 2005 or later. .NET Framework 3.5 SP1 or later. 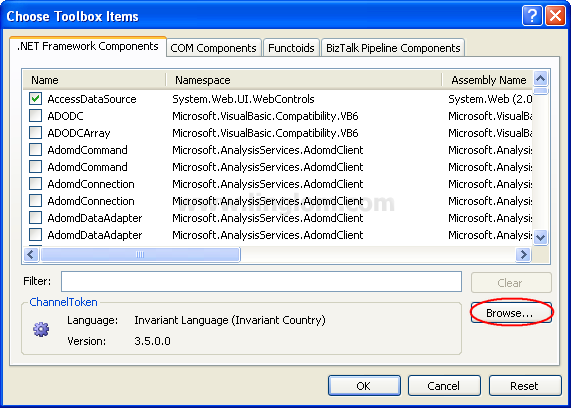 You can download Microsoft .NET Framework 3.5 Service Pack 1 from Microsoft website. 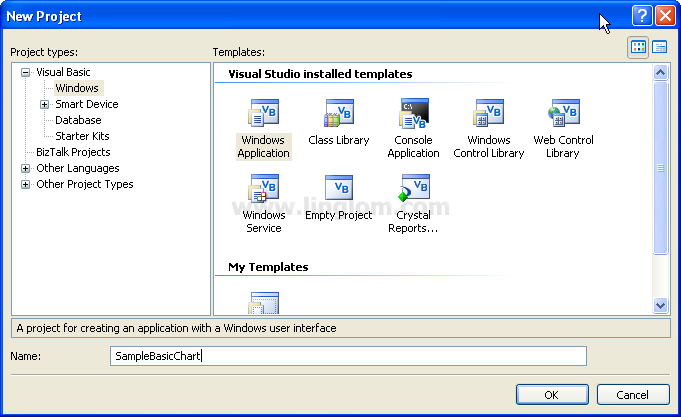 Install the requirement software as stated on the Requirement section. Open Microsoft Visual Studio 2005. 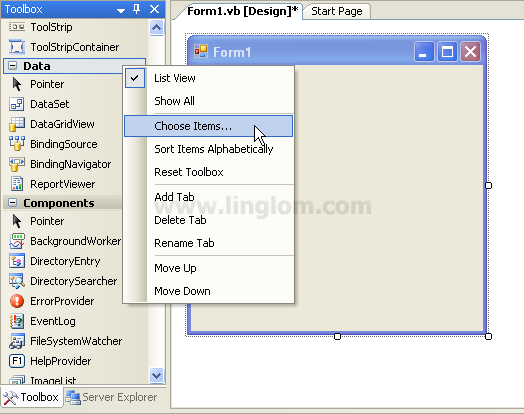 Create a new VB.NET’s Windows Application. Type the name of the project as “SampleBasicChart“. 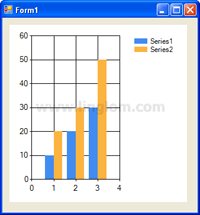 On Toolbox window, drag a Chart control from the Data category to the Windows Form. 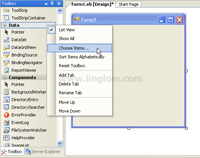 Right-click on the Toolbox window and select Choose Items. On Choose Toolbox Items, click Browse. 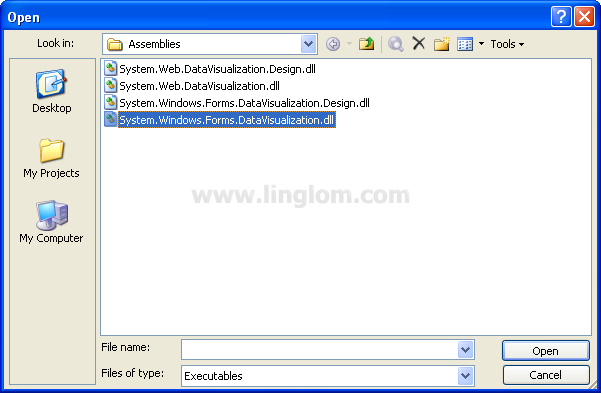 C:\Program Files\Microsoft Chart Controls\Assemblies and select System.Windows.Forms.DataVisualization.dll. Then, click Open. 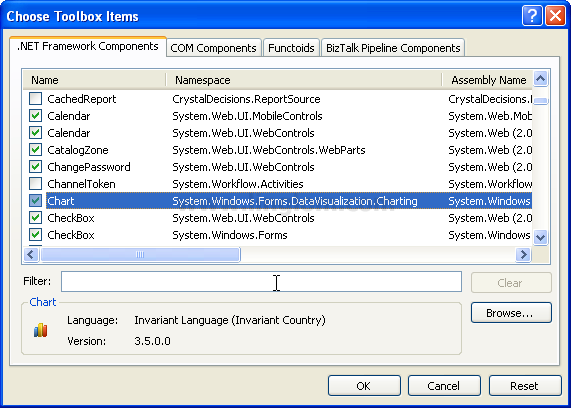 You see Chart control has been added to .NET Framework Components. Verify that its check box is checked and click OK.
On Chart Properties, you see an empty chart with a default series, “Series1“. Next, I’m going to add another Series. 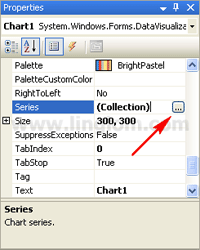 On Chart Properties, click the Series collection. Then, click the ellipsis button. 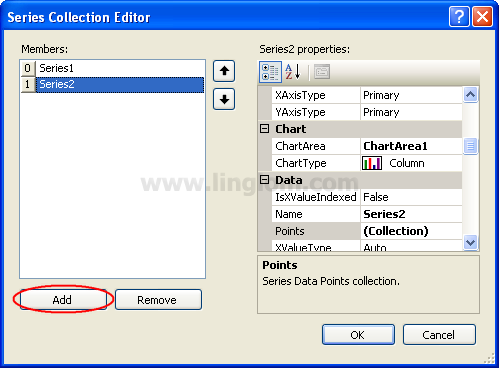 On Series Collection Editor, click Add. You will see “Series2” has been added to the collection. Now you have two series on a chart. 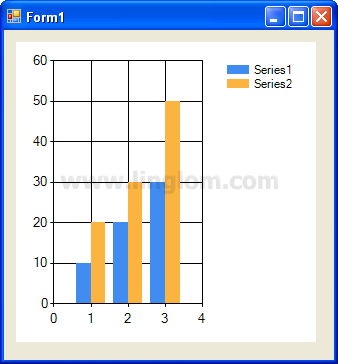 But there is not any data on the chart so I will add some example data point on each series. Select Series1 and click the ellipsis button on Points collection. 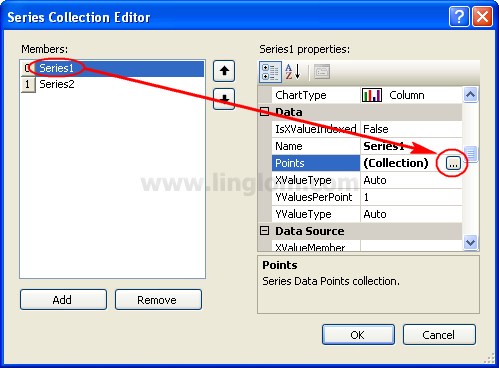 On Series Collection Editor, select “Series1” in the Members area and click the Points collection property. Then, click the ellipsis button. On DataPoint Collection Editor, click Add and assign a value “10” to the YValues property in the newly created DataPoint object. Repeat step 8 to add two more DataPoint object with values “20” and “30” repectively. 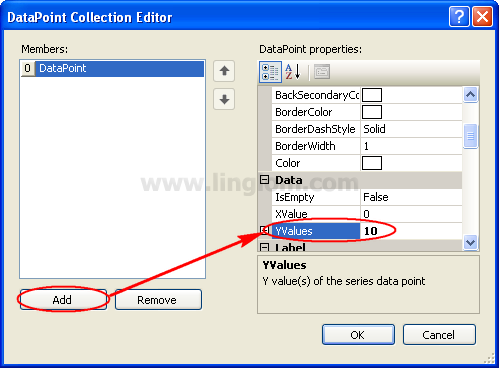 Then, click OK to close the DataPoint Collection Editor window. Note: These values are example values, you may use any value as you want. Repeat step 7-9 again on “Series2” with YValues as you want. 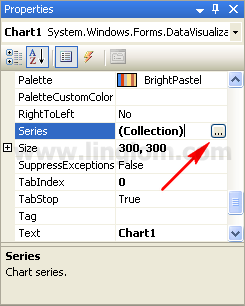 Then, click OK to close the Series Collection Editor windows. Run the project. You see the chart with two series as you created. Thank a lot ,It’s Helpful. Great website. Plenty of helpful info here. I am sending it to some buddies ans also sharing in delicious. And naturally, thank you to your effort! I appreciate if anyone tells me what to do… Thank you in advance ! this toolbox is turn off and it does not work!!! how I can turn it on?